Meade Variable Projection Tele Extender allows for a continuous range of projection magnifications during eyepiece-projection photography with a Meade LX-Series telescope or other brand of Schmidt-Cassegrain telescope with an SCT thread. The additional projection range is of particular value in high-resolution lunar and planetary photography. 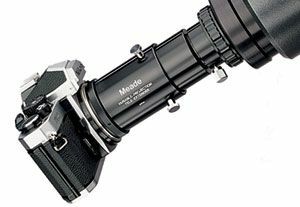 Meade Tele Extender attaches to the outer-diameter threads of the eyepiece-holder of the telescope, into which is inserted an eyepiece, typically of about 15mm to 32mm focal length. A T-Mount, ordered separately for your DSLR camera brand than connects your camera body to the Meade Tele Extender.